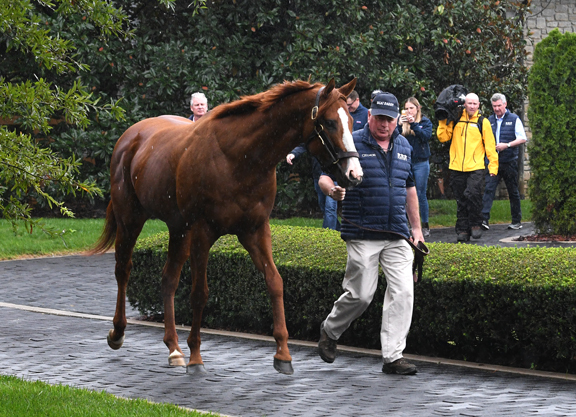 In September, Justify left WinStar Farm for a career at Ashford Stud after the undefeated Triple Crown winner was purchased by Coolmore. Two months later, he is on display for breeders and fans alike and has proven to be a popular draw during the Keeneland November Sale. We caught up with Adrian Wallace to see how the big chestnut was settling in. TDN: Justify has been here around two months now. He looks fantastic. How has he settled in? AW: He has settled in fine. We have been overwhelmed by the response from our breeders. It goes without saying he’s always going to be a popular horse, but he looks the part, he’s very mature, and WinStar obviously did a great job with him. He arrived here in good weight, and he has taken to his new role of being our number one show stallion quite well. We have probably had three hundred people through over the last two days. It will be interesting to see what happens when Pharaoh comes back. Having two Triple Crown winners in the same place will be quite overwhelming, I’m sure. But we’re quite happy with him, he’s a beautiful-looking horse, he’s 16.3, a lovely rich color, and in a great mood. And we couldn’t be happier. TDN: American Pharaoh will be back soon enough from Australia. In terms of breeders and the public, how do you prepare for a demand like that? AW: We’re close partners with Horse Country, who do a great job in promoting the farms and arranging the tours. So for the first couple of weeks in November, we stopped our Horse Country tours to give breeders a chance to come see the horse, and come see Mo Town as well, who’s also new for 2019. So once the sales are over, we’ll start again with our Horse Country tours and try to get them available to the fans again. But we want to be mindful of the horse. It wasn’t so long ago he was racing, so we want to do the right thing by him, not overwhelm him, and that’s why we’ve got sort of a fairly strict measure of time. TDN: It’s quite a historic achievement, standing two Triple Crown winners. AW: We’re the fourth farm in history to stand two Triple Crown winners, so that puts us now in a bracket that includes Claiborne Farm, Calumet, and Spendthrift. It’s a place that we’re honored to be in. Having horses like Justify and American Pharaoh is a responsibility to the business and to the industry, and it’s one we don’t take lightly. We’re looking forward to getting a good book of mares under both these stallions. Obviously Pharaoh is going to have his first runners next year, and his yearlings couldn’t have sold any better. And we think Justify will get a justifiably good book of mares. 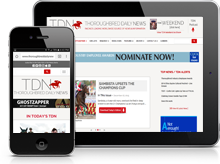 TDN: How do you go about sorting through the mares and trying to get him the best start? AW: We get the applications, some mares are more obvious than others. A Raving Beauty was booked into Justify this morning, so she’s obviously one you don’t have to think about too hard. We’ll breed 40 or 50 of our own mares to them as well. We hope to get a good solid book behind them. The criteria is that we want young, good-looking, well-credentialed mares, but they don’t have to be Grade I winners or Grade I producers. As long as they’ve got good families behind them and have the credentials, we’re happy to take a look at them. TDN: You have Uncle Mo and now you’ve got one of his sons, Mo Town, standing here next year. How is the demand for Uncle Mo from breeders this year? AW: Uncle Mo is one of those horses; he’s very young, but he’s already had six Group 1 winners in his first two crops. He’s a horse that doesn’t really need any introduction. He’s popular in the sales ring, he’s popular with buyers, he’s popular with breeders, and the trainers like them. Getting Nyquist in your first crop puts you in fairly rarified air, so I think he’s a horse that really doesn’t need too much explaining. But he’s been very well received as well. He, Pharaoh, and Justify really are the horses that are filling up very very well. And obviously our newer horses are starting to fill now as well. TDN: And finally, naturally after Accelerate won the Breeders’ Cup, his connections are campaigning for him as Horse of the Year. What is your argument for Justify as Horse of the Year? AW: There’s only one Triple Crown. There have only been 13 winners of the Triple Crown. And he is the 13th Triple Crown winner. He should be Horse of the Year. He’s one of those horses who, when he’s running, you never really doubt that he was going to win the race. He gave Mike Smith the confidence, he gave Bob Baffert the confidence to put him in the Santa Anita Derby in only his third start, and the Kentucky Derby only his fourth start. What the horse achieved this spring and early summer was quite incredible. I think being a Triple Crown winner in six starts was pretty amazing stuff. Let’s not forget the Curse of Apollo, either.